1. "Fact" Based Media Has Enabled Right Wing Hate & Are Thus A Threat To National Security! 4. Media: How The "Left" Enables GOP Tyranny - The Southern Strategy By The GOP Created Modern Politics But They Continuously Get Away With It! COAST GUARD OFFICER'S DOMESTIC TERROR PLOT, THE WHITE HOUSE'S CLIMATE PANEL & GOOGLE'S HIDDEN MICS 2/21/2019A Coast Guard officer is accused of domestic terrorism, a climate change skeptic will lead the White House climate panel, and hidden microphones are found in Google devices. i.e. 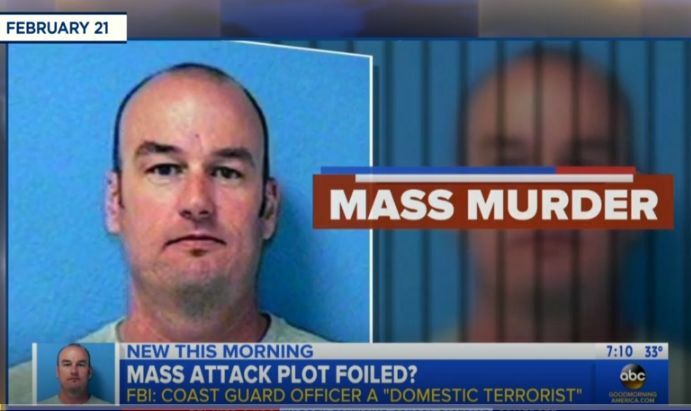 just another right wing domestic terrorist inspired by right wing media. As right-wing extremism and violence in the United States have surged over the last decade, mainstream media outlets have failed to properly frame and report on the growing threat. 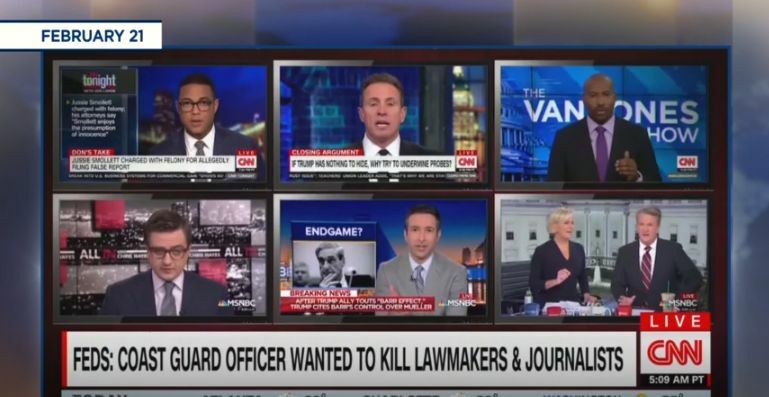 From print outlets to network and cable news, the normalization of white nationalist rhetoric and the overall growth of a violent ideology have been, for the most part, treated as backburner issues among mainstream outlets. 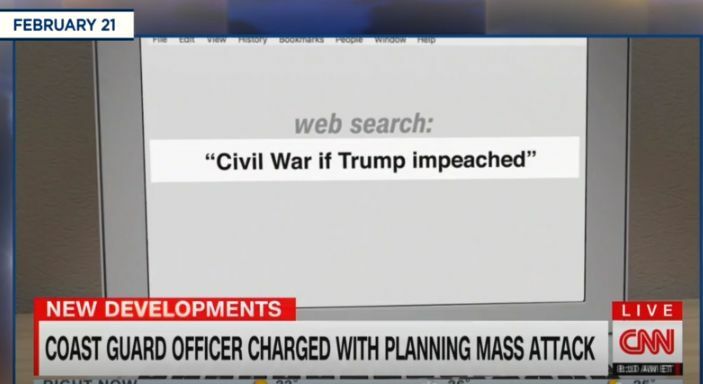 And while mainstream media play catch-up to what is a real and serious threat -- as the arrest of a self-described white nationalist within the ranks of the U.S. Coast Guard reminds us -- Fox News, the most-watched cable news outlet in the country, continues to unabashedly and irresponsibly pander to such extremists. Tucker Carlson: "There aren't that many hate crimes occurring in the country ... so they have to make them up"
Former White House adviser Sebastian Gorka fantasizes about aftermath of a civil war: “I am not worried which side would win” Gorka: "The last line of defense is you, dear listener. That's America; that's the Second Amendment"
Fox News' Sebastian Gorka: "We don't have people creating violence and encouraging it on the right"
Fox's Sebastian Gorka says Democrats have "normalized violence"
Frequent Fox News guest tells Laura Ingraham "we are in a civil war;" suggests everyone buy guns to prepare for "total war"
Since Donald Trump won the 2016 presidential election, Fox News has been airing dire warnings that the “deep state” is plotting a “coup” to “ruin” Trump’s administration. 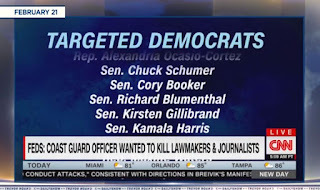 Fox personalities have warned that the FBI, the Department of Justice, the Democratic Party, and others “hate” Trump and are attempting to “overthrow the government” with a “bloodless coup,” “a political coup,” a “soft coup,” a “silent coup,” a “slow-motion coup,” and “the first attempted coup d'etat in American history.” Trump is now channeling Fox’s “coup” nonsense, and that could end badly. Study: Sean Hannity spent the last year laying the groundwork for an authoritarian response to the Russia probeI reviewed all 487 of Sean Hannity’s segments about the first year of Robert Mueller's investigation. Here’s what I found. To watch Hannity’s broadcast over the last year is to plunge into a strikingly paranoid vision of America today. Specifically, Hannity claims that the leadership of the FBI, aided by Democrats and the media, conspired during the 2016 election to exonerate Democratic nominee Hillary Clinton of the crimes they knew she had committed. At the same time, Hannity alleges that this cabal fabricated the narrative that Trump had colluded with Russia in order to prevent him from becoming president -- and that once Trump won the election despite these efforts to manipulate voters, his enemies continued to try to drive him from office. This narrative bears little relationship to reality: In the months leading up to the election, the FBI kept its investigation into whether the Trump campaign collaborated with the Kremlin’s effort to support his candidacy a secret while repeatedly calling attention to the Clinton probe, likely costing the Democrat the presidency. Nonetheless, the sinister cabal of Democrats, journalists, and the “deep state” are the villains of this story. And in Hannity’s telling, the host and his rotating cast of guests are the only thing standing between Trump and his annihilation. Hannity presents his show as the only venue willing to tell the truth about the story, casting reporting about Trump, Russia, and the 2016 election not as the result of serious journalism, but as part of a plot against the president. The Fox host is adamant that any suggestion of collusion between Trump associates and Russian officials is the stuff of “black-helicopter, tinfoil-hat conspiracy.” Instead, Hannity claims that the “real collusion” happened between Russia and the Democrats, in the form of various broadly discredited pseudoscandals. Hannity’s attempts to exonerate Trump are disturbing enough. But it’s his attempts to turn his audience against a set of new enemies that are truly dangerous. In Hannity’s telling, Mueller, a Republican who served as a Marine officer during the Vietnam War and was first appointed to run the FBI by George W. Bush, is running a duplicitous “witch hunt.” His team is composed of vicious Democratic partisans, and his personal relationship with former FBI Director James Comey is both suspect and actually illegal. This counternarrative of Hannity’s, repeated ad nauseum over the months, is designed to lead his audience inexorably to a simple conclusion: “Mueller's probe is tainted. Hillary is a criminal.” And Trump is justified in taking drastic action, including shutting down the investigation into his activities and then prosecuting and jailing his opponents, to protect himself. Hannity’s story is in step with the president’s own crude preferences and biases. Trump prefers an authoritarian model for law enforcement, in which the job of the Justice Department is to protect him and punish his enemies. Hannity’s show is providing Trump with both constant encouragement to act on those impulses, and is a powerful propaganda tool urging his base to support him if he does. Hannity benefits in turn from his private access to the president and Trump’s public displays of support for his program. This joint strategy is working. Hannity’s ratings have never been higher. And while polls show broad support for Mueller’s probe, among Fox viewers and Republican voters, the Fox host and his colleagues, in collaboration with the president, have successfully poisoned the well. The result is a very dangerous moment, in which the president could act on Hannity’s entreaties for authoritarian action -- and escape unscathed thanks to the supine congressional Republicans and the unyielding supportthe host and his allies have inculcated for the last year in Fox’s legions of viewers. Hannity is the chief author of the sprawling conspiracy theory, but he could not weave this vast fictional drama alone. The motley team he’s assembled to help him would hardly inspire confidence in other circumstances. Trump keeps channeling Fox’s “coup” nonsense. This could end badly. Amid declaring a national emergency on the U.S. southern border and playing many rounds of golf at his private club in Florida, President Donald Trump has found time over the past week to repeatedly gorge himself on Fox News programming and then regurgitate the network’s false ravings that senior Justice Department and FBI officials attempted a coup against him in the spring of 2017. At issue are claims that Andrew McCabe, the former FBI deputy director and a frequent target of the president, has been making while promoting his forthcoming book. According to McCabe, in the days after Trump fired FBI Director James Comey, Deputy Attorney General Rod Rosenstein discussed whether the 25th Amendment to the Constitution might be used to remove Trump from office on the grounds that he is mentally unfit for the job (in a statement, a Rosenstein spokesperson described McCabe’s “recitation of events” as “inaccurate and factually incorrect”). The president’s propagandists at Fox have gone into overdrive in response, filling the network’s airwaves with overwrought declarations that Rosenstein and McCabe had been fomenting a coup d’etat. This is simply wrong. A coup, by definition, is an extralegal seizure of power. That’s not what McCabe says was discussed. “Removing Trump from office by following the guidelines of the 25th Amendment would no more be a coup than removing him from office through impeachment or, really, than voting for another candidate in 2020,” The Washington Post’s Philip Bump pointed out. “It’s part of the system.” Rosenstein would be far from the first to suggest that the president’s often volatile and bizarre behavior justifies his removal from office. Trying to act on the amendment wouldn’t be a coup (though it seems extremely unlikely that the substantial constitutional hurdles needed to invoke the 25th Amendment would be cleared). But framing it as one can engender sympathy for Trump, rev up his base, and be used to justify drastic actions in response. The president, as is his wont, has been eagerly watching Fox’s coverage and tweeting out tidbits to push the network’s false conspiracy theories into the mainstream. SENATE INTELLIGENCE REPORT - NUMBER TWO 6/9/2008 Phase 2 of the Senate's report on whether the Bush administration manipulated intelligence to go to war finally comes out and man, is it worth the wait.